The Christian Wife Life: my first trip to Trader Joe's. 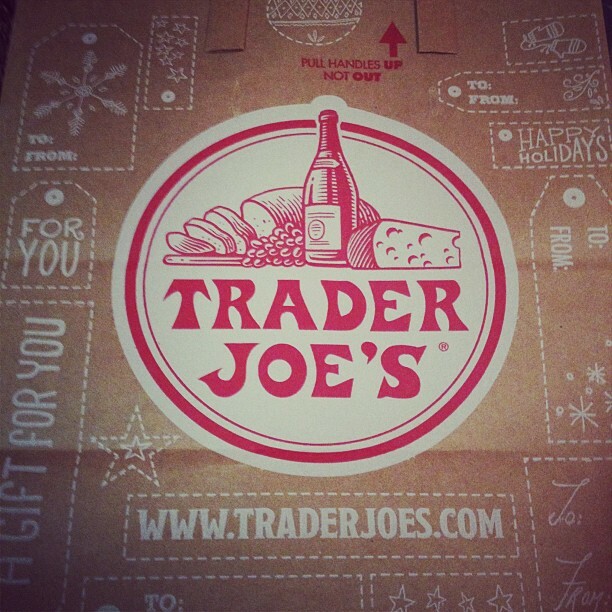 I've heard about Trader Joe's from so many people. I've seen pictures of delectable looking food items in cute packages. I've heard of the good deals and the good-for-you meals. But I had never experienced it until today. I didn't think there was one near me, but alas, there is one in Cary. Not too far. So after I almost completely finished my Christmas shopping in Cary (YESSS) I made my way over to TJ's. I admit, I was a little wary of a new grocery store. I've been going to Food Lion since I was born. Rarely do I even go to Harris Teeter, it's always the trusty Lion. Which I do love, don't get me wrong. Especially since there's one right next to us. But lately with it being basketball season, I've often needed a meal that can come straight from the freezer to the oven to our mouths. And the meals like that at Food Lion....aren't so great. So I arrived at Trader Joe's and was immediately won over by the stockings and lights in the windows. Yes, I was totally judging a book by its cover but I don't care. It was cute. It was festive. It enticed me. Then I entered and I got kinda...scared. There were lots of people and in my mind they had all been there at least 300 times and they could look at me and tell I was a complete noob. They knew what to get and where to get it and I just started wandering around staring at everything. What were all of these handwritten words everywhere? Why do the boxes look so fancy? Why are there chocolate covered raisins above the fish? As these questions ran through my mind I abruptly ran into a man's cart that was full of no less than 14 bottles of wine. I kid you not. This jolted me back to reality and I began my search for what I could use, rather than standing there wide-eyed in the middle of the isle. It took me a little bit to get used to all of the handwriting and interesting placements of items, but it was definitely a successful trip. I purchased at least seven meals, some lunch items, and a few other random things for about $50. Excellent. We devoured some Trader Joe's lasagna tonight and it was delisshhhh. I will absolutely purchase it again. Along with these candy cane cookies - YUM. Do you frequent Trader Joe's? Have you always been a Food Lion girl too? Harris Teeter? I know people say that Aldi is good, but there's not one near me at all. Are there any other relatively obscure grocery stores I should try? 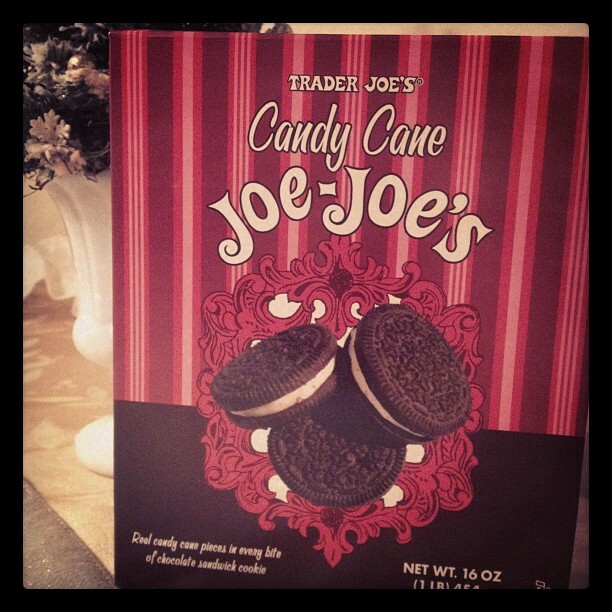 I LOVE Trader Joe's! I have been there a billion times and I always find something new I want to try (and can never get over the cookies being above the frozen foods). Aldi is great if you are on a budget and willing to give up brand name items. There are also a few things there you will buy once and never again *do not eat the pasta sauce*. There is a nice one on Maynard in Cary (not sure how far that is from you). Also you can get a lot of groceries (non refrigerated items such as cereal, bread, etc.) along with toiletries at Big Lots. I just became familiar with Big Lots a few months ago when we moved to Georgia but now I am in love! It is regular, brand name things but they are all closeouts so very inexpensive. Also, they have a rewards card where after ten purchases over $20 you get %20 off your ENTIRE purchase. Amazing! I do not mind going to Big Lots first then Walmart to get what I couldn't at Big Lots. You will be amazed by how much money you can save. I am done now...sorry I get a little excited about a bargain! I am not a fan of Aldi at all. But Trader Joe's? That is the place to go. Their wine is delicious and the food always fresh and amazing. They are reasonably priced and offer high quality products. Yum. I'm so jealous! I have wanted to go to one for a long time, but there isn't one near me! :( Here in TN Food City's are popular and in Florida it's Publix so those are my 2 I shop at regularly! I adore anything chocolatey and pepperminty. I may have to pop on over to TJ's and pick some up! Yay! I'm glad you got to go and that you enjoyed it! I felt the exact same way the first time I went to TJ's. Candy Cane Joe Joe's are amazing and they are seasonal so if you want to enjoy some in say July, you should freeze a box! One of my college roommates did that and I thought it was just brilliant. The Mandarin Orange Chicken is their #1 frozen food entree. Get the vegetable fried rice to go with it--yum! Their frozen corn and garden peas are the best. The spinach salad with feta cheese, cranberries and pecans is delish, too! And their brand OJ is the best--better and cheaper than Minute Maid or Tropicana.